All saffron is not created equal. Like olive oil and maple syrup, saffron also has several varieties. The International Standards Organization (ISO) ranks Grade I saffron as the highest quality for color strength, flavor and fragrance. Like most spices, saffron comes in whole and ground forms, but it is always dried. 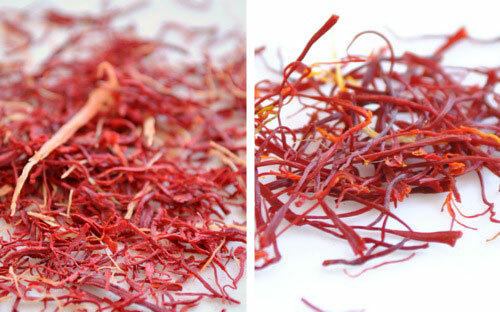 When packaged in its whole form, saffron looks like a mass of thin, dry threads. High-quality saffron does not contain floral “waste” (non-stigma plant matter) or inorganic debris, and it has low-moisture content. As with choosing fresh produce, looks matter when selecting the best saffron. While smelling and tasting saffron before buying may not be possible through sealed packages, assessing its color can help you determine its quality level. It is important to note that although saffron turns foods a golden color, the spice itself is not yellow. Whether saffron is whole or ground, experts describe its color as dark orange-red, burnt orange, deep reddish-brown or auburn. Ground saffron of lesser quality may be lighter in color, if it also includes the flavorless yellow stamens or if blended with yellow turmeric, a relative of ginger root often found in curry sauces. Reportedly one of the most expensive spices by weight, each pound of dried saffron can cost more than $5,000, although it is usually sold by the fraction of an ounce. The majority of saffron is exported from Spain, although the spice is also produced in India, Iran and even Pennsylvania Amish communities. The labor-intensive harvesting process must occur in a short time-frame, since the crocus flowers bloom for only a few weeks in October. Growers pick the plant’s purple blooms by hand and remove the stigmas. Producing one pound of saffron requires about 75,000 flowers, and each acre yields about 10 pounds of dried saffron. Make the most of an investment in saffron by storing and preparing it correctly. Saffron should be kept in an air-tight container (preferably not in plastic), away from heat and direct light, and the spice may be stored in a freezer for up to two years. For the fullest flavor and longest shelf life, buy whole rather than already ground saffron. Just before using it, finely crush the dry stigmas with a mortar and pestle, and then soak the powder in a small amount of warm water.